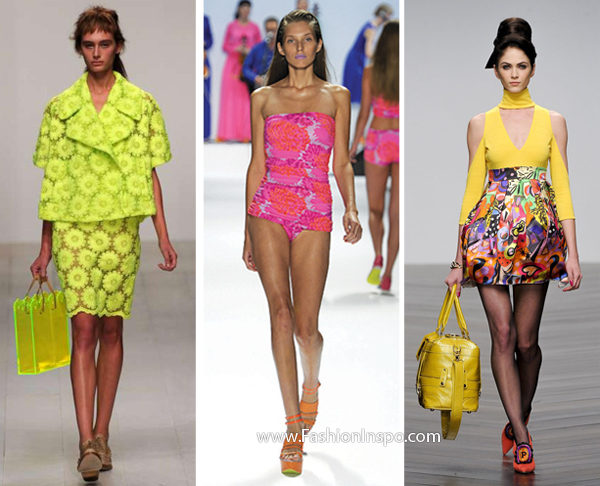 There is one word that best describes the hottest color trend of Spring Summer 2013 season – neon, which was spotted in the Spring Summer collections by the leading fashion houses. This year it promises to be as loud as never before. The neon colors (also called fluorescent) include lemon yellow, candy pink, bright orange and lime green. Since some may be intimidated to incorporate this bold trend into their everyday looks I prepared some useful tips on wearing the neon trend in the everyday life without the fear of looking silly. Whether you want to begin with the small details in neon hues or wear a head-to-toe outfit in trendy colors, I am here to help to embrace this color trend in best possible way. Those not daring enough to take on the neon trend in full swing should simply start with the accessories in fluorescent colors like belts, footwear, headwear and handbags. This way you will keep up with the latest trend without drawing too much attention to your look. Go for the neon color that is the most flattering for your skin tone and hair color. Also ensure to keep the rest of the look in subdued shades for the balanced outfit. Consider wearing a neon hat which is getting more and more popular among the fashion-forward girls. The big advantage of neon colors – they could be easily combined with each other without looking too bright. So demonstrate your creativity by teaming the neon yellow with pink for a striking look. Another way is brightening up the outfit in subdued hue with the item in fluorescent color. If you still find neon hues to be too bold, consider incorporating neon trend into your look by means of patterns instead of solid colors. This way you won’t look too bright and consequently will attract less attention to your outfit. If contrasting is not your theme, consider picking a certain neon hue and keep your entire outfit in same palette. But be prepared to become the center of everyone’s attention since neon outfits really stand out from the abundance of the dark-colored looks we are used to see on the streets. The monochromatic look in fluorescent hues will add chic and personality to your look. One thing is certain about the neon trend – it allows self-expression. Fluorescent colors are bright, bold and attention-drawing, which appeals to the contemporary fashionistas that are not afraid of attracting extra attention to their brilliant looks.